JEWELL — DJ Klonglan still isn’t DJ Klonglan, but this less than 100 percent version of him is pretty dang salty nonetheless. 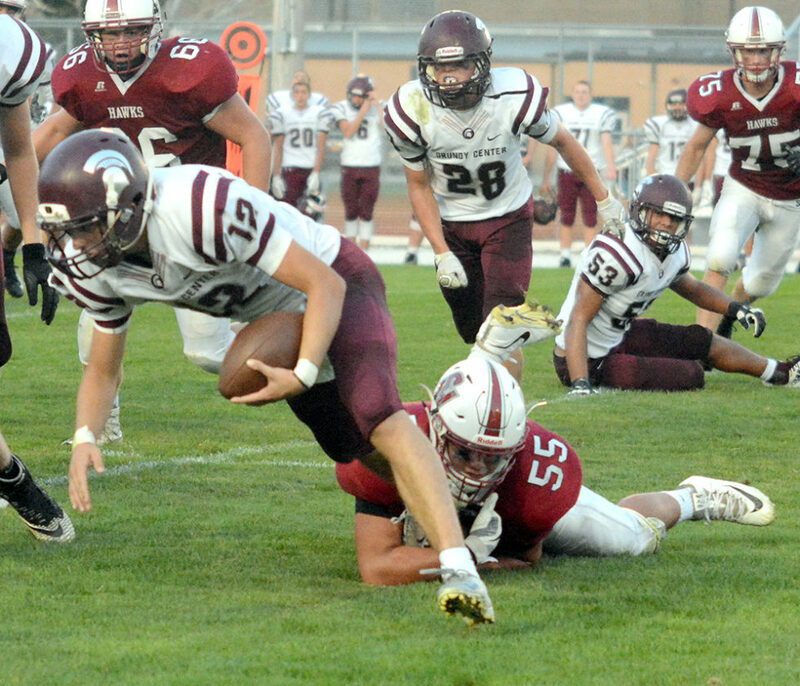 Despite a lingering injury that has slowed him since the preseason, the speedy South Hamilton halfback showed flashes of the home run ball carrier that he was a season ago at Taylor Field Friday night. 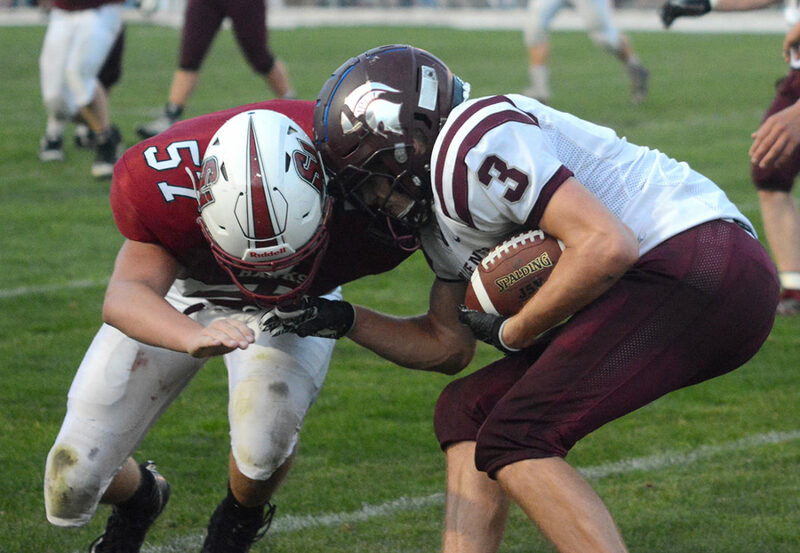 Klonglan rushed for a game-high 115 yards and South Hamilton spread the wealth to four backs that amassed 305 yards on the ground in a 26-14 victory over Grundy Center. Klonglan carried the ball a game-high 20 times and head coach Corey Klemp says he’s close to returning to form. 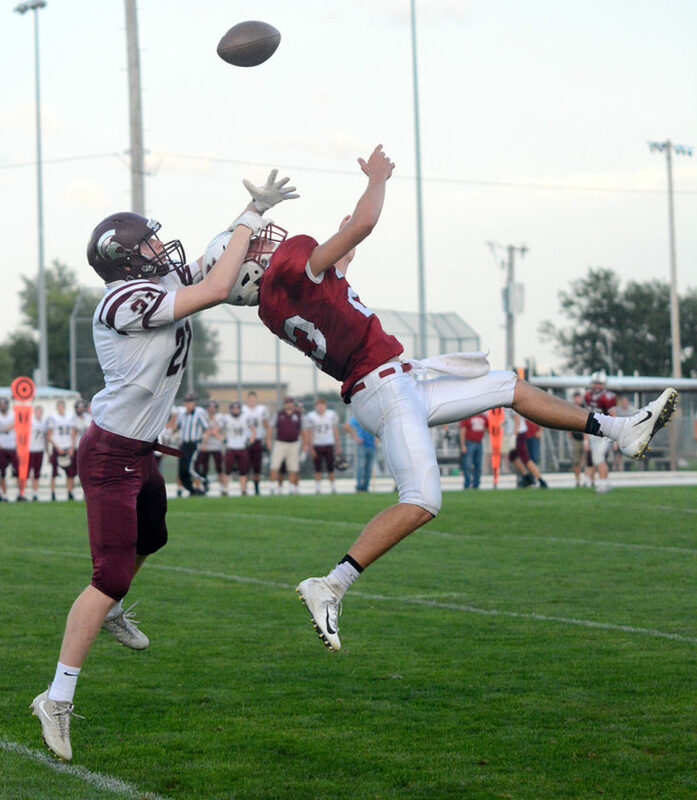 Grundy Center (1-1), which was impressive in its season-opening 34-22 win over Belle Plaine, had no answer for South Hamilton’s wishbone attack. Sam Lewis ripped off 82 yards on 14 carries, Trevor Thompson chewed up 54 yards on 18 attempts, and quarterback Cole Berg got loose for 54 additional yards on six rushes. Move the chains, control the clock. It worked well for the Hawks (2-0), who are 10-2 since the start of the 2017 season. “We’ve got a very balanced attack,” Klemp said. “Cole showed that he is a threat running the ball and he continues to progress as a threat to throw the ball, too. In just his second start under center, Berg completed 2 of 6 passes for 59 yards, one of them a 26-yard hook up with Cade Balvanz for a touchdown that made it a two-score game less than a minute into the fourth quarter. The second career start for Spartans’ quarterback Cale Hendricks didn’t go as smoothly. He completed half of his eight passes for 90 yards, but South Hamilton intercepted him three times before he exited the game late in the third quarter in favor of back-up Logan Knaack. Brandyn Feighner collected two of the picks and Brock Galetich had one. The Hawks have a state-leading six interceptions in two games. Klemp says his defensive backs are making aggressive plays on throws, but some of the credit also goes to the defensive line and linebackers for applying the pressure. 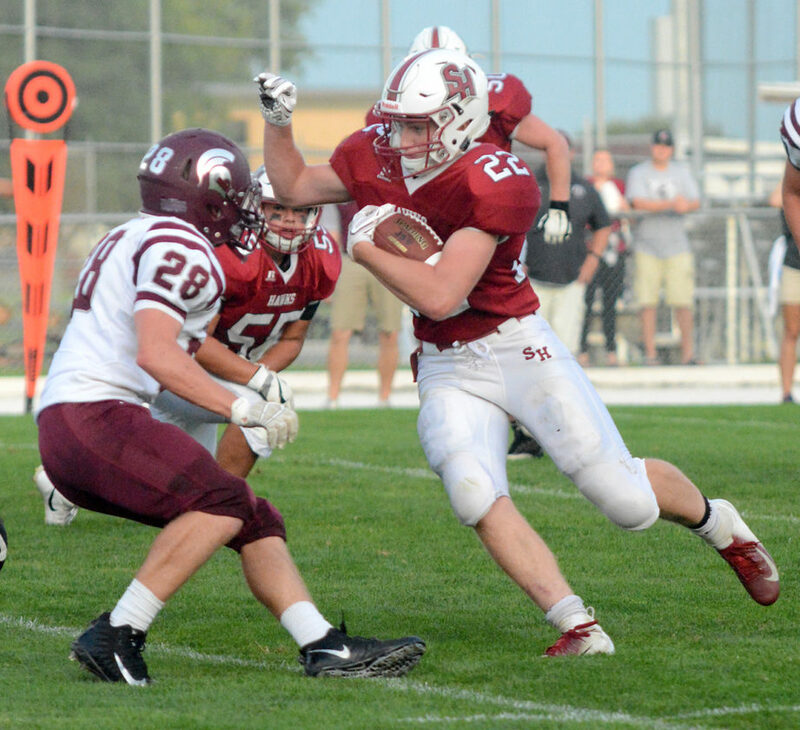 Grundy Center couldn’t do much on the ground, as South Hamilton limited the Spartans to 77 yards rushing. “Really across the board, we played pretty well defensively,” Klemp said. Lewis had a team-high five tackles, while Feighner made 41⁄2 stops. Balvanz, Klonglan, Zeke Balderas and Nathan Wilson all added four tackles. South Hamilton built an early 12-0 lead and never trailed in the contest. Thompson put the Hawks on the board with a 1-yard plunge across the goal line with 3:38 remaining in the first quarter and Berg broke contain and scurried for a 31-yard touchdown run just over 2 minutes later to add to the lead. Grundy Center sliced its deficit to 12-7 on the ensuring kickoff when Knaack shredded the Hawks’ special teams for a 91-yard touchdown return. It remained a five-point game until midway through the third period when South Hamilton again put a drive together. Lewis capped it off with a 3-yard run to paydirt and he also caught the two-point pass from Berg to make it 20-7. Knaack added an 11-yard TD run with 3:17 left in the period to again pull the Spartans to within striking distance. Berg’s toss to Balvanz came with 11:08 remaining in regulation. It will only get tougher for South Hamilton this week when it ventures out on the road for the first time. The Hawks will travel to Woodward to face Woodward-Granger Friday night at 7 p.m.
Woodward-Granger (2-0) dominated its first two foes, beating Madrid (55-29) and Ogden (46-7) by a combined 65 points. Klemp expects a challenge. “This will be a huge test for us at this point in the season,” he said. “They’re kind of like we are in that they know what they want to do and they go do it. There’s nothing fancy. SH — Trevor Thompson 1 run (run failed), 3:38. SH — Cole Berg 31 run (pass failed), 1:20. GC — Logan Knaack 91 kickoff return, Cale Hendricks kick), 1:07. SH — Sam Lewis 3 run (Lewis pass from Berg), 5:15. GC — Knaack 11 run (Hendricks kick), 3:17. SH — Cade Balvanz 26 pass from Berg (pass failed), 11:08. Rushing — GC: Austin Knaack 8-35, Logan Knaack 8-21, Cale Hendricks 7-19, Will Grames 1-2. SH: DJ Klonglan 20-115, Sam Lewis 14-82, Trevor Thompson 18-54, Cole Berg 6-54. Passing — GC: Hendricks 4-8-3 90, L. Knaack 4-5-0 36. SH: Berg 2-6-1 59. Receiving — GC: Nick Ascher 4-75, Zach Opheim 2-31, Travis Kuester 2-20. SH: Klonglan 1-33, Cade Balvanz 1-26. 1⁄2, Berg 1, Brayden Evans 2, Kyler Hodnefield 1, Sheldon Tapper 1⁄2.